Fresh flowers are delivered daily so the quality of your order is always guaranteed. Add professional design and continuous daily delivery and your order is sure to delight. 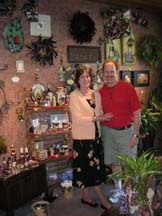 We also offer a large selection of beautiful and unique gift items from Washington and around the world. Make someone's day special with flowers from Cugini Florists. Whether across town or across the globe, we will take care of you! There is never an internet service charge! We value all our customers whether orders are placed in person, by phone or through the internet. While there is a modest charge for transferring orders to associate florists, we never charge just for the convenience of placing a web order. Our shop is open from 8:00 a.m. to 5:30 p.m., Monday through Friday, from 8:30 a.m. to 5:00 p.m. on Saturday. 24-Hour phone service is available, however, call-backs and deliveries will only be made during our regular business hours. Our shop will always be closed on the following holidays: Thanksgiving Day, Christmas Day, New Year’s Day, Easter, Mother’s Day, President's Day, Memorial Day, Father’s Day, Independence Day and Labor Day. We offer delivery service, by professional floral couriers, to the Seattle metro area, however, some areas, due to location and time constraints, will be served by our affiliate shops. If you have any questions or need more information, please contact us by e-mail at cuginiflor@aol.com or call us directly at (800)733-3901. Please do not send orders to the above email address, this account is reserved for questions and comments only, and is not monitored all the time. WE CANNOT GUARANTEE DELIVERY TIMES DURING VALENTINES WEEK. We will attempt to honor requests to the best of our ability, however, if you must have something delivered at a specific time please call for approval. Additional charges may apply. A local delivery fee of $12.00 will be added to each order, for each address in Renton. Addresses outside of Renton will be subject to increased charges. U.S. orders must be received before NOON in the recipient's time zone to assure same-day delivery, and some substitutions may be necessary. Orders received after that time will be sent with a request for same-day delivery, but we can only guarantee delivery on the next business day. We are unable to make deliveries on Sundays with the exception of Valentine's Day. Deliveries requested on this Sunday will be delivered Saturday or the following business day. "Anonymous" Orders: We require accurate contact information for all senders. If you would like your order to be sent "No Signature Requested" we will try to accomodate your request. However, if the recipient is concerned, or if contacted by any law enforcement agency, we will respond to their requests for information. Special Rush deliveries may be available.If you need a rush delivery, or a specific timed delivery, please call our shop. Our staff will assist you with availability and additional delivery charges. Local Zip codes outside of Renton may not align with our delivery areas and charges. Cugini Florists reserves the right to adjust delivery charges based on exact location. For more information please call during regular business hours. When we send your order through an affiliate shop, please understand that this is an independent business and may have different minimums and delivery charges. To expedite your order, if the difference is less than $5.00, we will automatically adjust your order. If the difference is more than $5.00 we will contact you via phone or email. Flowers are a highly variable product in form, color and availability. Substitutions are often necessary to create your bouquet due to the availability of certain flowers and containers. Care is taken to maintain the style, theme and color scheme of the arrangement, using flowers of equal value. Please note that we require a second choice on all orders. And, within 48 hours of Christmas, Valentine's Day and Mother's Day. Since our first priority is to get your order delivered we will have your order filled with the best available product. If you need specific items please call us at 1-800-733-3901. If "wiring" an order to a florist outside our area we will make the effort to get exactly what you would like, however each shop is an independent business that maintains their own inventories and prices.